Super Hero Boy: The best high chair for babblesations. 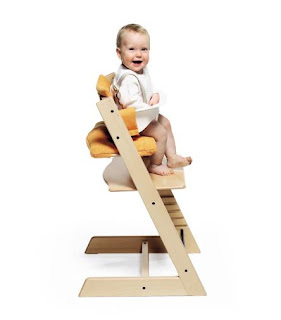 The best high chair for babblesations. Connor can hold a 20 minute "babblesation" (aka our new word for the conversations Connor and I have at the dinner table) without even batting an eye. He will talk you silly, mind you there is no understanding of anything he is saying. Our new high chair not only allows us to eat our meals face to face, it gives Connor a whole new perspective of the adult world and believe me he couldn't be happier. The Stokke Tripp Trapp is the perfect high chair for those social butterflies who want to sit one one one with their parents at the "big person" table. Connor loves to go to out to eat for the very reason that he got to eat meals directly at the table with us, and now he gets to do it every night at home. For those of you with a fairly modern decor such as myself you will love its sleek lines and all wood finish, but let me point out with its large selection of colors available everyone can find one that will fit their decor! I am usually all about the black furniture, and though we did end up going with black for our Tripp Trapp the blue was pretty tempting as well. The Tripp Trapp falls into my new favorite category of high chairs, that have a "life" well after your baby is past the spoon feeding age. The Tripp Trapp is fully adjustable and can adjust to hold a baby and then to hold an adult in just a matter of minutes (as well as everyone in between). The adjustable panels also give the child in the chair a way to rest their feet instead of dangling them like they would in a typical high chair. This teaches a child proper posture even from an early age. After using this chair for a few weeks, I can give you the mom perspective on it. Of all of the adjustable chairs we have checked out, to date the Tripp Trapp has the quickest and easiest adjustment to allow diffrent sized children to sit in the same chair. Actually all that is required is for the user to slightly loosen one bolt on the side of the chair just enough to allow for the slats to move up and down. Its quick and painless and I was able to move the seat down and out for an older child in just the matter of about one minute. The seat on the Tripp Trapp even in the infant position is very wide.. Though this does mean that the chair has a larger footprint than other adjustable chairs we have covered it also means that its SUPER easy to clean. It still by far has about half the footprint of a traditional metal and plastic high chair. The optional baby rail and cushions are not "necessary" but certainly I would buy them as it gives me an extra piece of mind and I'm sure Connor's hiney appreciates the cushion. We have used the chair with and without and its really a personal preference. I will say that the cushion is very easy to put on and remove and it does wash up very well. The harness on the Tripp Trapp is really outstanding. Its the most secure harness I have seen on a high chair to date (traditional or non traditional). The straps go not only around the waist but over the shoulders as well which gives the user some extra security as it is possible for a child to attempt to stand up in the chair due to the foot rests. The Tripp Trapp is unusual for a high chair as it does not have a tray (not even in the accessories) the child using the chair is pushed against the dinner table to eat, much like you would do if you were dining out. Though honestly this took a bit of an adjustment for us in the end it has turned out far to our advantage. Though at first we just used a mat to feed him his finger foods at the table, I have now gone to feeding him off of a plate. Though we did have a few plate to floor experiences in the end it has allowed Connor to learn table manners at a very early age, he now eats out of a big boy plate and/or bowl and its rare at this point for either to hit the ground. As I mentioned earlier the color selection on the Tripp Trapp is better than I have ever seen on any other high chair, with the selections of cushions as well, the possibilities of color choices is pretty endless. Stokke is currently running a promotion for those of you that already have a Tripp Trapp, if you send in a picture of your child using his or her Tripp Trapp they will send you a free bib! You can also enter to win a complete feeding package from Stokke including a Tripp Trapp as well as some great products from Skip Hop & BuiltNY. Check out that contest here. Want one of your own? Tripp Trapp is available online and on Amazon!